(17/P63) TRENTON – Department of Environmental Protection Commissioner Bob Martin joined Trenton Mayor Eric E. Jackson and other officials today to break ground for the first phase of restoration work at Cadwalader Park, designed by landscape architecture master Frederick Law Olmsted Sr. in the 1890s to be a calming oasis in the middle of New Jersey’s bustling capital city. The long-awaited $2.4 million project involves improvements that, over time, will restore the 125-year-old park as a regional attraction and destination. Cadwalader Park is notable for being the only park in New Jersey designed by Olmsted Sr., considered the father of American landscape architecture. Olmsted is perhaps best known as the architect of the U.S. Capitol grounds in Washington, D.C. and one of the architects of New York City’s Central Park, as well as hundreds of other urban parks across the country. The first phase of the restoration will better connect the park’s active recreation areas to the more passive upper park via a handicap-accessible pathway between the two areas. The pathway also will link Cadwalader Park to the nearby Delaware and Raritan Canal State Park. In addition, several historic stairways and existing pathways in the upper park will be restored, including a pathway along the D&R Canal that will connect the pedestrian bridge to an existing picnic pavilion. Other improvements during this phase call for redesigning the fitness and play areas, which include extensive playground equipment upgrades; planting and replanting trees; and relocating the picnic grove to an area where there will be a grill for every picnic table, as well as a separate area with additional grills for events. These changes will offer better use of the picnic area for recreation groups and leagues, while also allowing families to picnic near their children’s activities. The old picnic grove site will be redeveloped in the future as a concert area. Park access will be limited in construction areas, until at least August. The DEP’s Green Acres Program is providing $1.2 million of the project cost as a grant to the city. Green Acres is funding another nearly $1.1 million of the balance as an interest-free loan to the city, and Trenton will fund the remaining balance of $120,000. Other renovations at the park – such as historic interpretative signage in 2015, construction of the picnic pavilion in 2011, and a three-year restoration of a former deer paddock into a wildflower meadow in 2014 – were funded from a variety of sources including the U.S. Department of Housing and Urban Development, the New Jersey Historic Trust, the New Jersey Wetlands Mitigation Council, corporate donations, and city funds. Also joining today’s event in support of the project were New Jersey Senator Shirley Turner and Assemblywoman Elizabeth Muoio. 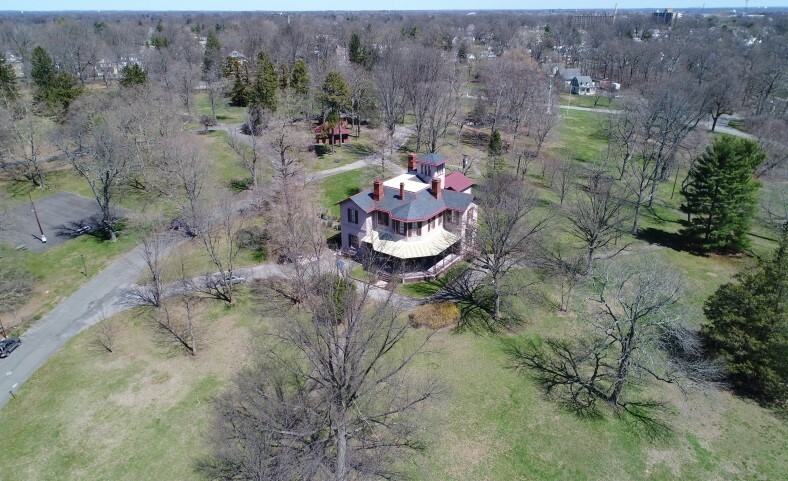 Edmund C. Hill, a businessman and politician who founded Trenton’s park system and later served on the city’s Common Council, pushed for the city to purchase the 80-acre estate property that became Cadwalader Park in 1888. Hill later chaired the Parks Committee, which provided the park with a bandstand, prairie dog farm and bear pit, as well as benches and picnic tables before hiring Olmsted in 1890 to assist with designing the park. By that point, Olmsted had designed parks in cities across America for 30 years. At the time of Cadwalader Park’s construction between 1890 and 1892, many cities were considered noisy, gritty and smelly. At the time, Olmsted designed Cadwalader Park to take advantage of natural scenery and bring a sense of calm to those trying to escape the noise of urban living during the Industrial Revolution period. In its heyday and even today, the park offers a variety of scenic views. Visitors may be able to see the Delaware River or distant vistas in Pennsylvania, or enjoy the solitude along wooded ravines, streams and ponds.